Hello again! 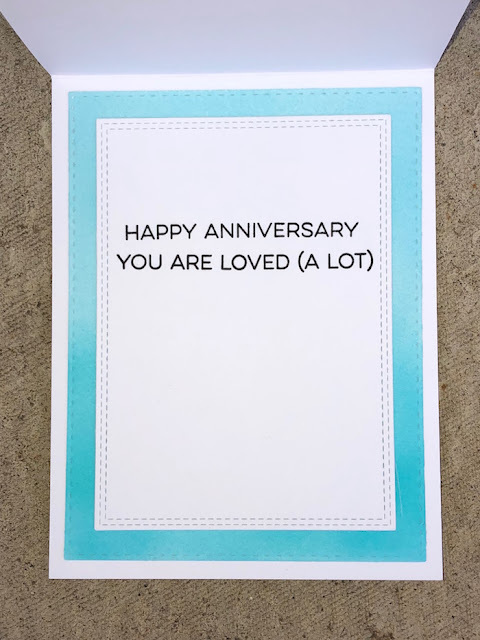 Today I have an anniversary card that I made for my husband to share with you! 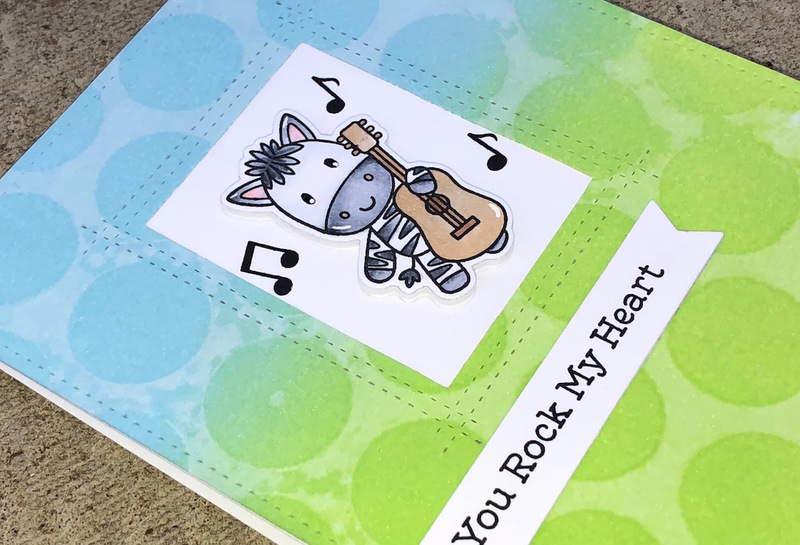 It uses a number of adorable MFT products including the sweet Jungle Vibes stamp set that features sweet musical jungle animals. I love the fun sayings included in the set and thought this was a perfect playful set to use for my card as my husband loves to play guitar. I started out by using some distress oxide inks to create a blended background. I then used the large dot stencil and went over it again using the same colors. Finally I spritzed the background with a water and perfect pearl shimmer to give it some shine. After finishing off the Zebra with some details to the eyes with a black glaze pen and then a white gel pen, I stamped out the musical notes and then stamped all the sentiments and die cut the one for the front to make it stand out. For the inside panel, it was a little too white, so I added a blue distressed background, just to give it a pop of color. How can you finish such a sweet card without a matching envelope? LOL! 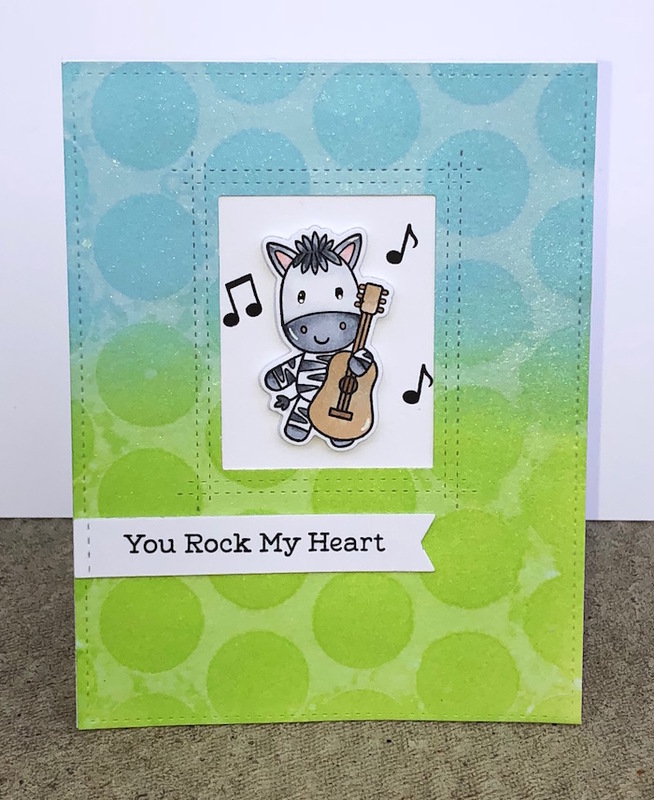 Just had to have an excuse to stamp out the other sweet zebra. Love how this turned out! Here is the finished card and envelope together. I would like to enter this card into the Simon Say's Stamp Anything Goes Challenge. Today I am sharing a sweet baby shaker card. I haven't had the chance to make a shaker card in awhile and I had gems and bling just screaming to be used! A friend and colleague just became a Grandma and so I thought this was the perfect time to indulge in some bling filled crafty time. I used a variety of products that are listed at the bottom of the post for your convenience. The stencil that used for the inked background (MFT Graduated Dots stencil) is unfortunately no longer available, but here is a picture in case you have it in your stash or something similar. I ink blended my three distress ink colors on the background and then redid the same blending with the stencil over top. Love the effect that this creates. I then spritzed some water over top to give it a bit of texture. I then used a die to cut it out for the front card panel and give it that great stitched detail. 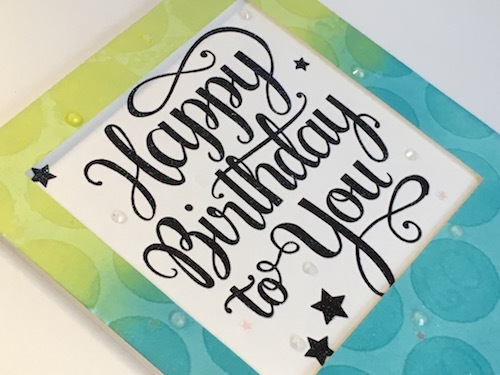 After doing my stamping and die cutting for both the inside and the front of the card, I inked the inside of the card to match the front. 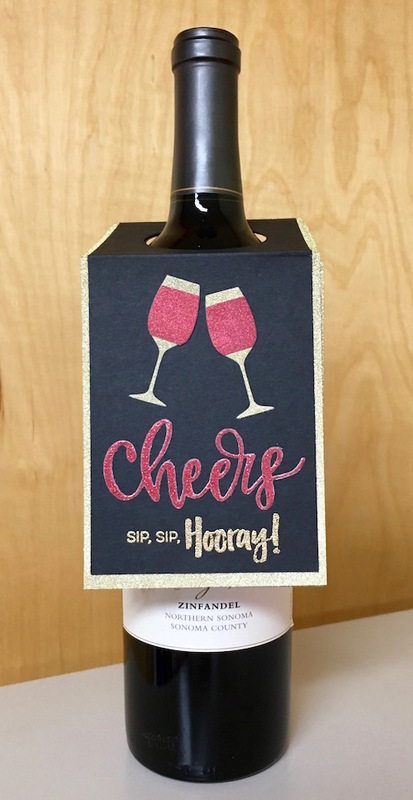 I used raspberry distress ink to create the paper to die cut the shaker window and the greeting strip on the front. 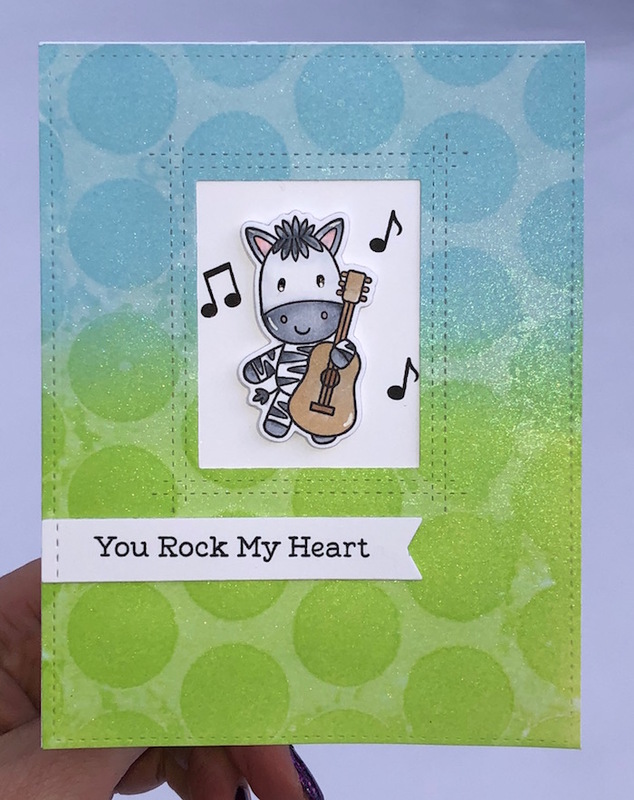 I added some shimmer to the onesie and on the heart and a few of the dots on the inside of the card for some added interest. You can never have too much sparkle . . . right?? I stacked up the middle fancy frame die 9 times to make my shaker focal piece. I wanted lots of room for all of that gorgeous bling to move around in. I used a variety of items in my shaker window (listed below) and sealed it all off with some acetate. I used the Hero Arts liquid adhesive to put this all together and loved how easy it was to work with. At this point, I decided that I needed to tie in some of the white on the onesie and I added tiny white dots with a gel pen to the background, greeting strip and shaker frame. I then added a sprinkling of gems over the front panel. Again, I used the Hero Arts glue -- really love how easy it came out. Finally, I added a matching cute onesie to the envelope to make it all coordinate. I would like to enter this in the Simon Says Stamp: Anything Goes Challenge. I hope you have enjoyed my project today! Thanks for visiting! 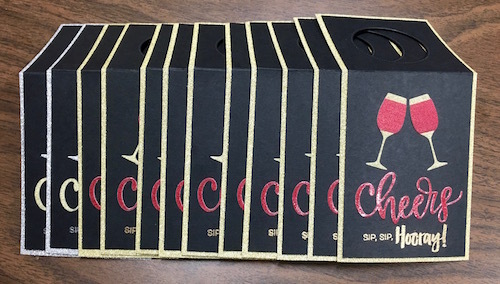 Wine tags . . . Thought I would get in a second post today . . . Whaaaat? That hasn't happened in literally years! Woohoo! It is a great day in the craft room! 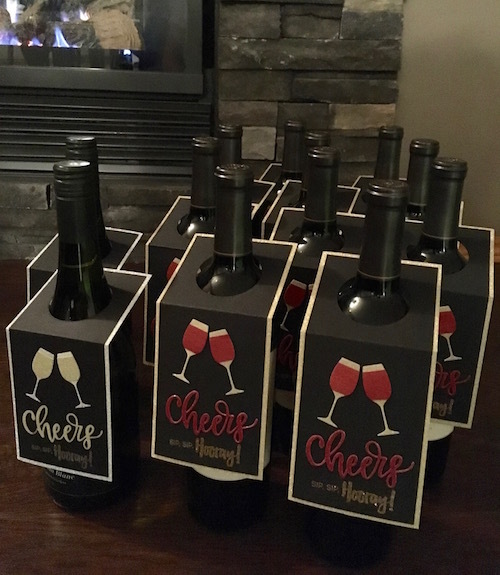 These are wine tags that I created for a friend who is in a wine exchange. I didn't have the much coveted MFT die yet, so created my own design with my paper cutter and a couple of circle dies. The stitched die came from the Waffle Flower Flower Circles Die set. 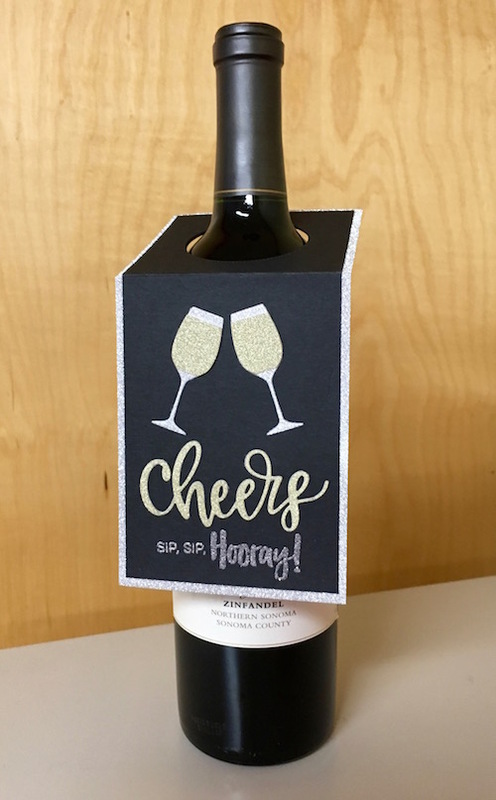 The stamp set is the MFT Uncorked set and the dies are the Cheers Die-namics and the Wine Service Die-namics dies from MFT. Just love these products! I used some DCWV glitter paper as well as some MFT glitter card stock for the gold, silver and red shine you see. I gold and silver embossed the stamping to match the glitter paper. I love how these turned out! Picture from my friend showing the tags ready to hand out . . . she thinks they are too pretty to give away and wants to keep them now -- LOL! They do look nice in the dim light in front of the fire place don't they? I think I will enter these in the Simon Says Stamp Anything Goes challenge as well! Thanks as always for stopping in! 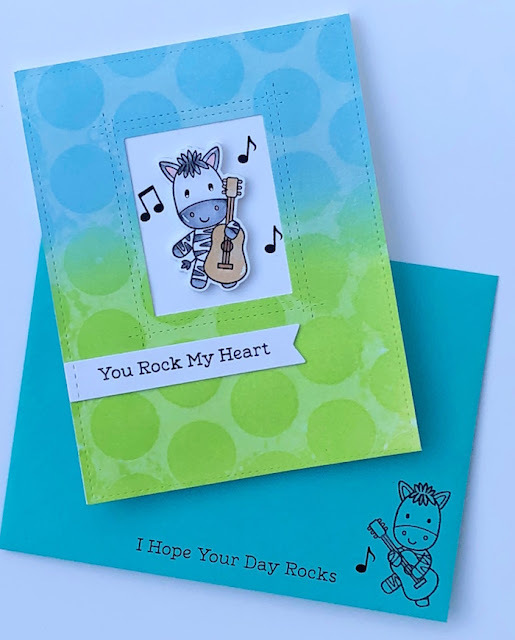 As I hibernate on this truly cold, but oh so bright Sunday morning, I thought I would take a few minutes to upload a card. Goodness knows my school life is taking over my crafty life and I rarely get to post anymore. Anyhoo, I thought if perhaps I keep my blog posts to a minimum as far as explanation goes, then I can focus on at least getting my pictures up as I do miss having this record of my crafting. 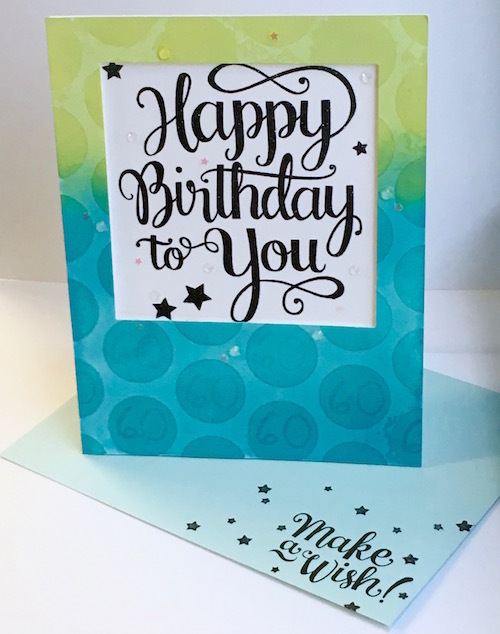 Today's card is a 60th birthday card. I did some ink blending in the background and then used Versamark Ink to subtly add in the number 60 on the bottom bubbles. The sentiment is from one of my favourite Mama Elephant Stamp sets: Make a Wish. I added some dimension by die cutting the top panel and adding foam tape to pop it up, while keeping the focus on the sentiment by having it show through the window. I couldn't resist adding some clear drops and some cute tiny star confetti. 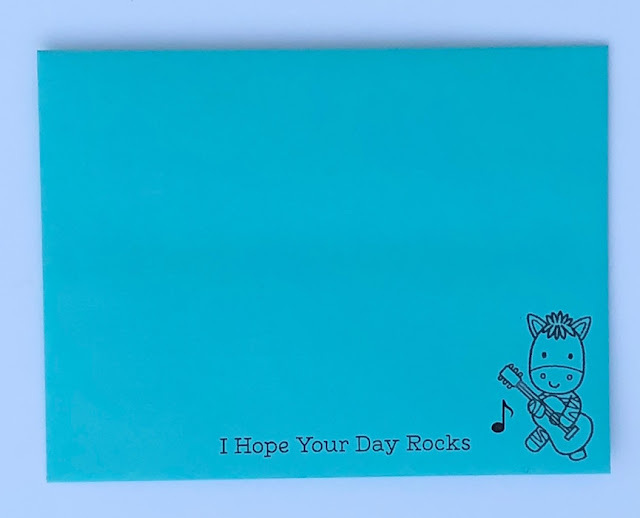 Of course a matching envelope had to be added! I would like to enter this card in the Simon Says Stamp anything goes challenge. Another long absence on the blog doesn't mean I haven't been creating. I have done quite a few cards in the last couple of months, but did them in the wee hours and just couldn't find time to post them. This working for a living, sometimes gets in the way of things we want to do. Anyhoo, I did want to share this sweet "Hello" card that I have turned into a thank you card as a way of easing back into things. 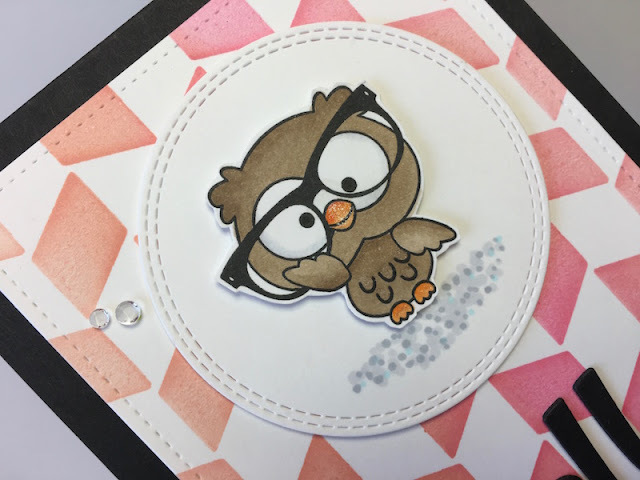 I absolutely love this adorable owl from Pink and Main "Owl Nerds" stamp set. I colored him with copic markers and used the MFT chunky herringbone stencil to ink up the background. 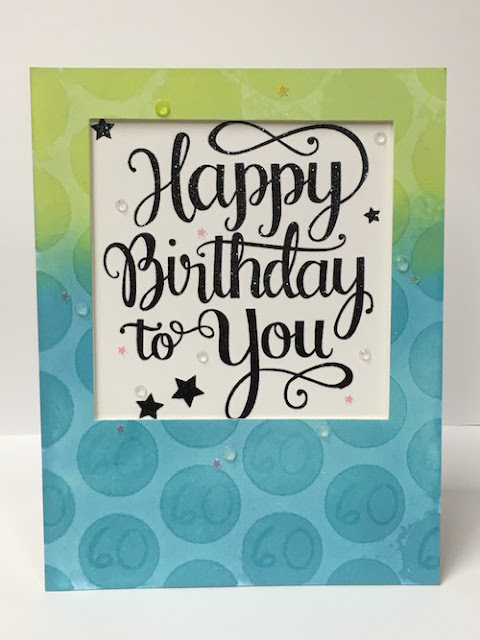 I used a paper smooches hello die that I layered up 3 times to give it some dimension and to draw the eye in. I used a little clear shimmer on his beak and feet to add some sparkle with those sweet little gems. The inside greeting is from a Stamps of Life "Thanks for two years" club stamp set. 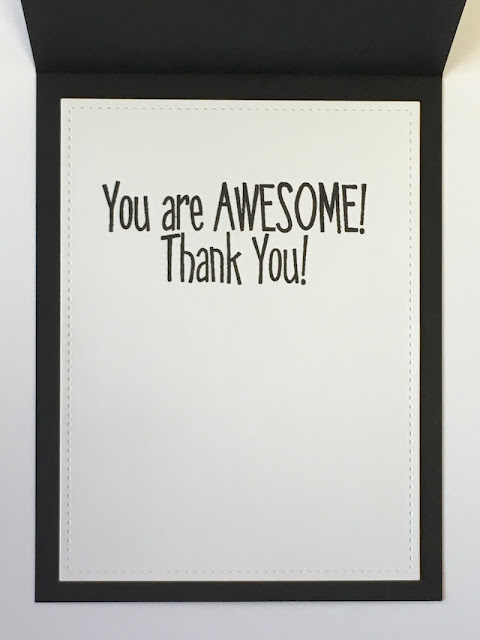 I'd like to enter this card in the Simon Says Wednesday challenge. This week it is ANYTHING GOES!